The piping system is taken underground generally for the utility services like cooling water supply to various units and cooling water return to cooling tower for line sizes normally 18 inch NB and above, other water services with big pipeline sizes, big oil supply lines and various sewer systems in the process units of the chemical, petrochemical and refinery type of plants. 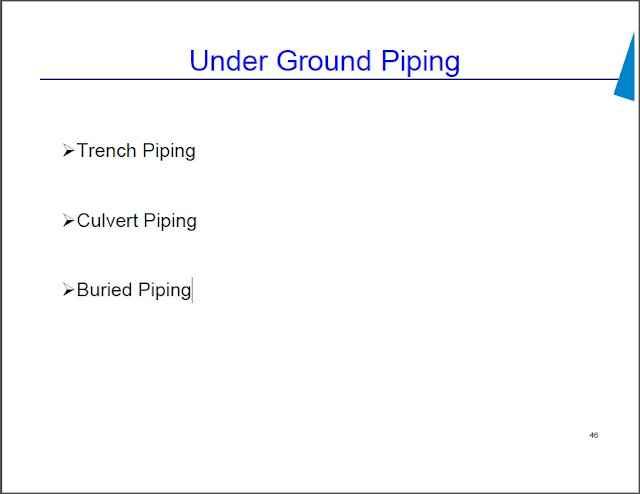 The term “underground” applies to the piping – both buried or in trenches. The underground system consist of gravity flow drainage system carrying process waste, spillage, reclaimable hydrocarbons, sanitary and storm water, firewater and drinking water system.